Hotel Villagio (formerly Villagio Inn & Spa), Monday unveiled the second and final hotel to undergo its major transformation and multimillion-dollar renovation which completes the rebranding of The Estate Yountville. This new property is a bold reimagining of luxury in Yountville and offers an entirely unique experience than that of its serene sister property, Vintage House. This reimagined Napa Valley favorite now provides guests with the rare opportunity to choose from two distinct accommodations that co-exist at The Estate Yountville. Hotel Villagio is spiced with a vibrant social undercurrent and offers brand new, fully redesigned guestrooms and public spaces perfect for entertaining groups as well as a state-of-the-art spa experience. This spirited sister of Vintage House, which reopened in October of 2017, embodies a bold and glamorous hotel stay unlike any other in Napa Valley. 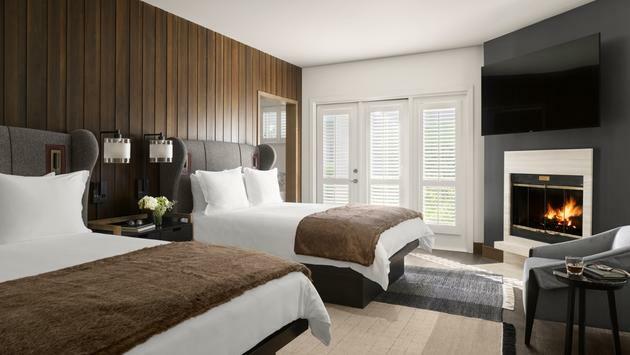 Its contemporary vibe articulates the exclusivity of the 112 guestrooms and 22 suites, each layered with natural materials and textures, bringing the character of Yountville and its surroundings into the luxe stylish design. The lobby features warm woods, dark stone and industrial metal lighting, creating a sophisticated area to relax, entertain and socialize. The alluring Villagio Bar & Lounge invites both locals and visitors alike to make new friends and connect with familiar ones in the heart of the property while looking out on the resort’s private vineyard. Anchored by a new beverage herb garden and steeped in the farming history of Napa, the Bar & Lounge at Hotel Villagio offers edible flowers and stunning garnishments to the craft cocktails being served in this social hub. A stylish pool table anchors the lobby space and the ceiling opens to wooden beams featuring dramatic wood trusses that invite guests to explore The Estate Yountville’s bold re-envisioning. Hotel Villagio guestrooms are polished retreats with streamlined fireplaces and sun-tapped terraces lending to their exceptional appeal. Hand-knotted rugs draped over wood plank floors and mahogany headboard walls set the stage for a romantic escape with dark undertones and a refined juxtaposition of industrial meets rustic elements. Open wood and iron closets provide a unique display while affording extra space, and freestanding soaking tubs are illuminated with elegant lighting, creating a sensual ambiance in the unforgettable marbled bathrooms. The Villa at The Estate, a luxurious five-bedroom, residence-style accommodation, opened its doors to guests in September 2018. Designed with elegant entertaining in mind, The Villa features a private pool and jacuzzi, fire and water features and an entertaining and gaming area. A Grand Salon is the focal point of The Villa and can be used as the central living and relaxation area. Soaring 20-foot ceilings flanked by endless walls of windows overlook the secluded pool and private hot tub area. The shared gathering space has a living room and entertaining area as well as a Chef’s kitchen including state of the art appliances from the Officine Gullo refrigerator which retails for $25,000 to the exquisite La Cornue oven which retails for $8,000. Guests of The Villa can request an Estate Chef to curate a personalized menu featuring fresh and locally sourced ingredients for guests to enjoy around the indoor or outdoor dining table that seats up to twelve people. Both the master and the second largest guest rooms are Napa Valley’s only accommodations furnished with Hästens $40,000 2000T king size beds, which are hand-stitched at their factory in Köping, Sweden using the most premium all-natural materials. The Villa experience is further amplified with a personalized concierge service to assist with confirming an in-room and around-the-Valley itinerary prior to arrival. The Villa is bookable for small gatherings and events and overnight stays from $10,000 per night. Guests at Hotel Villagio are also invited to unwind in a stylish private cabana at the recently refreshed pool. Relaxation can continue at the redesigned Spa at The Estate where guests will receive personalized treatments accentuated with ESPA products. The spa is one of the largest in the Napa Valley area with seven treatment rooms and five luxurious couples’ spa suites, each boasting an indoor and outdoor fireplace and lounge area, steam shower, sauna and outdoor hydrotherapy soaking bath. Hotel Villagio will also become a destination for small groups looking to hold meetings or events in one of the most luxe spaces in the area—complete with marble boardroom table, built-in audiovisual, separate private lounge area, and an adjacent outdoor patio with views of the Mayacama Mountain range. The evolution of the beloved and award-winning properties at The Estate Yountville marks one of the most ambitious renovation projects to take place in the area. 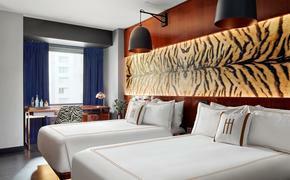 Leading hospitality interior design firm Hirsch Bedner Associates (HBA) worked in tandem with two of the firm’s subdivisions, Illuminate lighting design and Canvas art consultants, as well as with SB Architects for the exteriors, to spearhead the transformative renovation. The Estate renovation project weaves a cohesive, narrative-driven harmonious design throughout both Vintage House and Hotel Villagio. Each property has a distinct personality, but both are influenced by the understated elegance of Yountville, resulting in an all-encompassing and one-of-a-kind wine country experience for guests. The carefully-curated artwork program by Canvas is playful and romantic. Custom pop art pieces celebrate all things Napa Valley—from wine tasting to romance to a weekend getaway with friends. Illuminate Lighting collaborated on this multi-disciplinary project, providing lighting design that reinforces the subtly upscale interiors, highlighting the custom art pieces and curated objects, tying the interior and exterior experiences together though lighting.